Too often, high-performers are promoted to a higher position in a company and then left to their own devices to navigate the transition. What do you need to know to succeed at the next level? 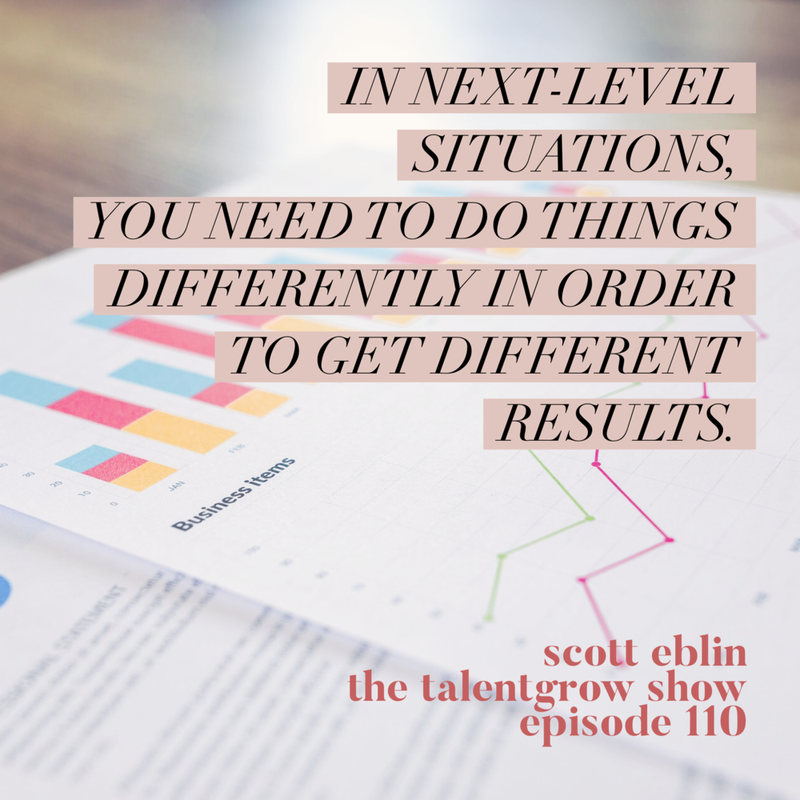 In this episode of The TalentGrow Show, I bring back my first-ever guest on the show, author and executive coach Scott Eblin, to share insights from the newly revised 3rd edition of his best-selling book, The Next Level: What Insiders Know About Executive Success. He believes that there are three leadership imperatives that are critical to success: manage yourself, leverage your team, and engage your colleagues. Listen to discover the meaning of these imperatives while also learning about leadership presence, the importance of being humble and vulnerable with your team, and why finding a ‘work-life balance’ isn’t necessarily the right goal to set your sights on! Ultimately, Scott outlines which behaviors and beliefs you need to let go of at the next level, and which ones you need to pick up. Plus, we discover that we are both engaged in similar new hobbies… Listen and don’t forget to share this episode with others in your network! Scott Eblin is the president of the Eblin Group, a leadership development firm committed to helping executives lead at their best and live at their best. For the past 17 years, Scott has worked with some of the world’s best-known companies and organizations as a leadership expert, best-selling author, global speaker, and executive coach. Scott’s work and experience is captured in two best-selling books: The Next Level: What Insiders Know About Executive Success and Overworked and Overwhelmed: The Mindfulness Alternative. We briefly discuss the ‘conscious incompetence’ stage of the Learning Cycle (at around 11:50). Here’s an article that discusses its origin (which is not Blanchard nor Hersey). I’ve described this process in this blog/vlog post: What do leadership and driving a car have in common? [vlog], so check it out if you’re curious. TEASER CLIP: Scott: Next level is not just the next level. It’s not just moving into a next level role. It could be literally 85-90 percent of the people in any audience I talk to would answer yes to this question – are you in the same job you were in a year ago today, but the scope is a lot bigger today than it was a year ago? 90 percent of them are going to raise their hands on that. That’s a next level situation, right? Same job, bigger scope. Are you operating in a situation where the performance bar has been raised since last year? That’s usually 75, 80 percent of the people. Are you operating at a constantly changing competitive environment? That should be 100 percent of the people. They all are. What those scenarios – promotion, bigger scope, higher performance bar, competitive environment – what they all have in common, two things. You’ve got to get different results in each of those different scenarios and I think they’re all next level situations. Halelly: Hey, hey, TalentGrowers. Welcome back. I’m Halelly Azulay, your leadership development strategist here at TalentGrow and I am welcoming back Scott Eblin this week to the show, and we’re going to talk about how to get to the next level of leadership. He’s going to share with you three different imperatives that are critical to success as you move into the next level. And we’re going to break it down with specific examples and when Scott shares a personal story at the end, he causes me to want to share a personal story of mine, and he asks me some more questions about it, so there’s some bonus content with something I haven’t really shared on the show before. If you’re intrigued by that, listen to the end. Here we go, Scott Eblin on the TalentGrow Show. TalentGrowers, what a treat this week. We have our guest from my very first episode is back on, Scott Eblin. He’s the president of the Eblin Group, a leadership development firm committed to helping executives lead at their best and live at their best. For the past 17 years, Scott has worked with some of the world’s best-known companies and organizations as a leadership expert, bestselling author, global speaker and executive coach. Scott’s work and experience is captured in two bestselling books, The Next Level, what insiders know about executive success, which is going to be released in an upgraded, renewed edition – we’re going to talk about that today – and his other book is Overworked and Overwhelmed, the mindfulness alternative, which you may recall was the subject of episode one of the TalentGrow Show. So, Scott, I welcome you back. Scott: Hey, thank you Halelly. It’s great to be back, and I’m so honored that I go to be episode one. And you told me earlier, here we are in episode 110! Amazing. Congratulations. Halelly: Thank you. It is amazing. It feels like such a long journey, but it also feels like it was a blink of an eye. I don’t want to assume that people heard the first episode or remember hearing it – all that long time ago! – so let’s make this episode a stand alone whole thing, and ask you that question that I always ask my guests at the beginning. Tell us about your professional journey briefly. Where did you start and how did you end up where you are today? Halelly: That’s amazing. How old were you when you received that? Scott: Probably 14 or 15. Pretty early. I was never an athlete as a kid, so anything that had leadership involved in it, that was kind of what I did instead of athletics. That’s where it started, and I was corporate private sector person for about 15 years, prior to starting the Eblin Group, 17 or 18 years ago. Kind of gravitated toward things that were the intersection of strategy and leadership development. I always really enjoyed thinking and acting on strategy, developing strategy and executing on strategy, and since I was a Cub Scout, I’ve enjoyed leadership stuff and leadership development. I started out as a coach, just exclusively executive coaching, 18 years ago, and I thought of it as the intersection of strategy and leadership. Things developed from there. I wrote the first book, The Next Level, that we’ll talk a little bit about today. That came out in 2006, and things kind of continued to build around that content and those ideas and here we are in 2018 talking about it. Halelly: Amazing. Congratulation on your success. Of course as you said, you weren’t an athlete before, but in your bio it says you’re a registered yoga teacher now? Scott: Yeah, is that athletics? Halelly: I think that counts! Scott: Registered yoga teacher. I probably have, honestly, I can’t believe I’ll say this out loud, at age 57 I probably have more hand eye coordination, definitely more balance, than I’ve ever had in my life. Sense of balance. You talk about balance in the rest of life, but I got into yoga, seriously, consistently at the end of 2010. I think you and I talked previously about that I have Multiple Sclerosis and a friend of our family who is a health expert and a registered yoga teacher herself said I should do yoga. She’s had really great outcomes with people with autoimmune and neurological issues and so I got into it, really just to try and begin to heal myself, and that worked. And I’ve just kept at it and so back in 2013 I did yoga teacher training, the 200 hour entry-level teacher training, and it was a lot more work than I thought it was going to be, but it was a really good experience. Yoga is part of my daily thing now. Halelly: Incredible. Definitely TalentGrowers, listen to Scott’s previous episode, because the story of how he has healed himself, he’s living in a very grave condition I would say, and successfully and productively with M.S., and that was not by mistake. It’s very, very intentional through his proactive actions, so he tells more about that in episode one so you should go listen to it. Well, congratulations on releasing the third edition of that bestselling book, The Next Level, and in it you describe three leadership imperatives that you say are critical to success. You say they are manage yourself, leverage your team and engage your colleagues. So, in this brief format here, I’d love for you to give us an overview of what you mean by each of these, and why are they such imperatives? Scott: Thanks for bringing that up. That’s actually one of the things that’s new about this edition is that language. Those three imperatives. What The Next Level has always been framed around, and it still is, but I’ve just tried, I’m always on this quest to simplify things even further. I want to make it as simple as possible. I think that people are busy and I just want to make it super accessible and have it resonate with people as much as possible. I’ve always talked about leadership presence in The Next Level, and one conclusion I’ve come to in the last five or six years is I think people like you and me probably talk about leadership presence a lot more than people that are actually in corporate leadership positions themselves. What do we even mean by leadership presence? You could probably ask 10 talent development people for definitions and get slightly different answers from each of them. I tried to break it down in the original editions, the first and second editions, and this one too, as sets of behaviors that fall in the three big categories – personal presence, team presence and organizational presence. Then I started thinking about it and what do people really have to do at the essence? What do they really have to do for those three buckets? That’s what I came to the language around imperatives. Then the three imperatives being manager yourself – because that’s sort of the foundation for everything else. If you’re not managing yourself effectively, you’re probably not going to leverage your team very effectively. Working through and with your team, you’re not going to be able to do that if you’re not managing yourself effectively and there’s a lot of reasons why that’s the case. Managing yourself is also the foundation, I think, for engaging your colleagues, because what that requires is some bandwidth. Mental and emotional bandwidth and bandwidth in terms of your time and your energy and really, that’s where so much value is created in organizations is when colleagues engage with each other and collaborate together in effective ways. Those to me are the big three. Manage yourself, personal presence, manage your team, team presence, and engage your colleagues, organizational presence. Again, it’s just a quest to keep it more and more simple. Halelly: I like that, because I think it just makes it a lot more accessible. The language is less obtuse. It just says what it is. I like that. I want to go a little bit deeper into those, but I feel like we’re putting the horse before the cart, because we’re not really talking about the theme of the book, which is moving to the next level. So, let’s kind of move backward to move forward. What is this? Why did you write a manual for people that are moving to the next level? I have a sense of why, but tell our listeners why. Scott: Sure. That’s actually changed over the years, too. What’s changed over the years is when I first wrote the book, the book first came out in spring of 2006 and I spent most of 2005 working on it. The audience that I was writing for back then – and I am still definitely writing for this audience, but they’re not the only audience anymore – but the audience I originally wrote for were people who were moving into executive-level roles for the first time in their career. I know from experience, as an ex-corporate executive and I know from lots of experience in coaching corporate executives who are new to their roles, especially when they’re new to the executive level for the first time, that’s a really, really huge transition in people’s careers. You don’t know what you don’t know, but you kind of know that you don’t know it. It’s like the known unknowns. Scott: Thank you very much, yes. It’s conscious incompetence, because I talk about that in the book, actually. Thanks for reminding me of that. I didn’t make that up, I think that’s Ken Blanchard or Paul Hersey that came up with that. That was the original audience, new to the executive level. What I’ve learned over the years from coaching people, and I do like you do, a lot of leadership development programs and workshops and keynotes and stuff, and just have a lot of opportunities to interact with people out in the world in the leadership world. What I’ve learned is next level is not just the next level. It’s not just moving into a next level role. It could be literally 85-90 percent of the people in any audience I talk to would answer yes to this question – are you in the same job you were in a year ago today, but the scope is a lot bigger today than it was a year ago? 90 percent of them are going to raise their hands on that. That’s a next level situation, right? Same job, bigger scope. Are you operating in a situation where the performance bar has been raised since last year? That’s usually 75, 80 percent of the people. Are you operating at a constantly changing competitive environment? That should be 100 percent of the people. They all are. What those scenarios – promotion, bigger scope, higher performance bar, competitive environment – what they all have in common, two things. You’ve got to get different results in each of those different scenarios and I think they’re all next level situations. Next level situations, if you want to get different results, as Einstein reminded us many years ago, you probably have to do things differently. And so one of the big questions we’re framing in the book is what do you need to pick up, and what do you need to let go of from a behavioral and a mindset standpoint to get the different results that are expected of you in this next level situation? By the way, they’re not mutually exclusive. Most people, if I’m talking to 100 people, most people, leaders in corporate America or the world, are going to raise their hand on at least twice and usually three and even four times on those four scenarios. Next level means a lot of different things to me at this point. I didn’t start out there, but that’s what it means now. Halelly: And it definitely leads to that overworked and overwhelmed as you describe. Scott: No doubt. Which is why you’ve got to manage yourself. Halelly: Absolutely. I know we just talked a little bit before we started recording about how in this new release you’ve actually incorporated a lot of the insights you’ve learned over the years about the whole self and managing all of the different inputs and outputs so that you can create a balance of some kind. Scott: Yes, absolutely. I’ve gone deeper than I have in previous editions of The Next Level on the whole idea of managing yourself. I mean, just using that language is new, the manage yourself language, but also just like you suggested, I’ve learned a lot in the last eight years since the second edition was released. I’ve learned a lot from working with a lot of different clients and a lot of different situations, what best practices are for most people. I’m trying to present those and the original book, the original edition, had the life GPS framework that I talked about at length in Overworked and Overwhelmed, but there’s still a chapter in this new book about life GPS, but just with a lot of fresher and newer insights about how you really put it to use. I’ve been fortunate enough to see many, many people put it to use in the last 15 years, especially in the last seven or eight. Halelly: I want to ask you a million questions and for this to have three hours. Because we don’t have three hours – dang it! – I would love one of those stories. Share a story. And I would love to have listeners walk away, knowing maybe something practical from each of those buckets you were describing. Scott: Okay, great. Let’s start with the manage yourself bucket. There are so many things you could talk about there. We talked about some of them back when we were doing episode one. A couple of big ideas. One, if you feel like managing yourself is an opportunity because, as you just eluded to, all that stuff you’re trying to keep up with at the next level is making you feel overworked and overwhelmed, you’re likely in a chronic state of fight or flight. Your sympathetic nervous system is working overtime, and that has enormous impacts, most importantly, on your long-term health and well being and your life expectancy. In the short run it has a big impact on your professional capacity and your ability to get things done effectively. So, 100 percent of people have heard of fight or flight and two percent of people have heard of rest and digest. Rest and digest is the nickname for your body’s parasympathetic nervous system. One of the things I’m talking about – and this is one maybe not one story, but I’ll try to get it to that – we hear a lot about work/life balance. Everybody is on this mythical question – maybe not mythical, but this Holy Grail kind of quest – for work/life balance. I don’t think it’s the right call. Because it’s temporary. Whatever state of balance you have is temporary, until the next thing happens and then you’ve lost it. What I really prefer to have people think about is life rhythm. Not work/life rhythm, just life rhythm. What’s your life rhythm? There are different elements in any, take music as an example, there are different elements in a piece of music that are more prominent or less prominent at any given time, and it’s the same thing with your life rhythm. What are the things you need in your life to make it more likely that you’re going to lead and live at your best? What kinds of routines, physical, mental, relational, spiritual, do you need in your life to reinforce that at your best state? I always encourage my clients to look for routines that are in the sweet spot between on the vertical axis easy to do and on the horizontal axis likely to make a difference. Work in the upper right-hand corner and let’s look for simple routines that will help you activate your rest and digest response, rhythmic repetitive motion will do that. Here’s a story for you: we did a program last summer, entirely virtual actually, never met them in real life, but it ran for four or five months. These were candidates to be partner in one of the larger public accounting firms and it was on leading and living at your best. We had them working through the live GPS framework as part of that. So what was really cool is you hear stories all the time from people about little things they’ve done to make it better and so one guy in the program was having a one-on-one coaching session. He said, “I’m not getting any exercise. I’ve let that go. My wife and I don’t get as much chance to talk as we used to and that’s bad for relational stuff. But by the way we’ve got a dog that needs to be walked.” So I said, okay, what’s the connection between those three things? And he said, “Let me think about it,” and long story short, he decided he was going to email his wife when we were done – which he actually did this, I followed up and he told me later this was exactly what he did – emailed his wife and said, “I would like to schedule three dog walks a week with you in the evenings after dinner.” And she was flattered that he did that. That’s what they started to do. The half-hour walk after dinner, so now I’m moving, getting some exercise that I wasn’t getting. I’m with my wife and we get to talk uninterrupted for 30 minutes, and the dog gets walked. Just easy to do? Yeah. Does it make a difference? Yeah. Halelly: Five minutes! That’s beautiful. Scott: I hope that answers the question. If I say anything, work on rest and digest and work on easy to do, likely to make a difference. That would be the takeaway for people who were listening to this. Halelly: Cool, I love it. By the way, there are studies that actually show you literally make yourself more grounded by putting your feet in the grass. Scott: I’ve read that. Yeah. Halelly: I’m going to try and dig one up and put it in the show notes. Scott: I’d love that. I could use a good one. Halelly: Challenge on. Leverage your team – what’s something tangible? Halelly: They get things done, right? However busy they are, they’ll get it done. Scott: That’s the number one answer on Family Feud, they get things done. Everybody answers that right. So be the go-to person, great thing to be, until it’s no longer the great thing to be. When is it no longer a great thing to be? When the scope is too big and you just can’t operate that way anymore, it’s like the individual heroine or hero. So the shift that everybody has to make is that shift from being the go-to person to someone who builds and leads teams of go-to people. That’s what you’ve got to do, is put your emphasis on the building of the team of go-to people instead of being the go-to person yourself. Which means you’ve got to let go of stuff that you like to do or that have helped you make your reputation up until now. You’ve got to let go of that and pick up the coaching kind of mode. I’ve had lots of different examples of people who have worked really hard to do that. One way to do it, and I’ve had a lot of clients use this technique over the years, that no matter what you’re working on, it’s really helpful to tell the people you work with what you’re working on and what you hope the benefits are going to be of that and to ask them to help you stick to that. Ask for action ideas that are relatively easy to do, likely to make a difference that they can see you doing. I’ve had a lot of clients get involved … I’ll give you an example from one guy. It isn’t leveraging your team standpoint. It’s a different way to build and to go-to people. Two things happened from that. Six months later, when we did the mini-assessment 360, he’s a lot better from his team’s standpoint. Probably more important, really actually six months later everything they were measuring was either yellow or green, and there wasn’t anything that was red anymore. The performance, not surprisingly, improved, and the team was able to step up and really be the go-to people he needed them to be because he wasn’t getting in their way. In his case he was getting in their way by bringing them down mentally and emotionally. There are other ways. Even when you’re intervening too much and you’re getting in their shorts too much and trying to be the hero, again, that brings them down too. That’s really annoying to your team, when you do that. I could go on, but don’t want to take too much time on this. Halelly: I get you. For him, being humble and being vulnerable to say that to them, to ask for their help and then he needed to model that he means it, so if they took the courage – because it takes courage for them – to actually try to give him the sign, it’s really important that they don’t get any feeling of rebuke from him. Scott: Totally. That’s totally true. It took a lot of courage on his part and on their part, and it was a terrific example of role modeling. Role modeling openness to feedback, vulnerability to change, all of that. He was a great example. Halelly: Awesome. We need one more example for engage your colleagues. Scott: Engaging your colleagues is really about playing a bigger game, and my coaching these days is really more kind of C Suite and their direct reports, so I don’t hear this as much as I used to, but when I was coaching individual senior directors and directors or even VPs, people of that level, when I would do the interviews for them I would quite often hear from more senior people in their interview loop, their feedback interview loop, “He’s really great. She’s doing really great, a killer job at what they’re doing. It’s time for them to play a bigger game.” What they meant by that, and it didn’t really matter the company, start acting as if you’re already there. If you’re a senior director, start acting as if you’re already a vice president, and doing the things and asking the questions and holding the conversations, making the proposals, expressing the point of view that vice presidents do. Start acting as if that’s the case and so I don’t really have a Dave or a Donna name the person kind of story on this one, but I’ve had a lot of clients who that idea of, “Okay, it’s an opportunity for me.” As I’m thinking about it, I can think of some recently in our group coaching programs that have done this. Halelly: You want to step back and start that? Scott: Yeah, so here’s one way to play a bigger game. Probably it was Hillary Clinton and her campaign for the Senate in New York years ago that popularized the term listening tour. She spent the first couple of months of that campaign going on a listening tour with the people of New York. I kind of co-opted that term for corporate land and our group coaching programs for the senior directors and VP level people, I always encourage them when we get to this part of the program, the organizational presence, to conduct a series of listening tour conversations. There’s a woman that was in one of our group coaching programs earlier this year that wrapped up a coupe of months ago. Rebecca, I think. She was super talented person, had a lot of cross-functional leverage that she probably wasn’t tapping into in her organization, and so by listening tour, what you’re doing when you’re conducting a listening tour conversation, which is this is kind of what jump-started her, was you go out and you ask really open ended questions of cross-functional colleague, somebody that you have an adjacency with, but maybe not a co-dependency with. There are opportunities, perhaps, to create some synergy. The very first question on the script – this is in the book, that part of the book on organizational presence and engaging your colleagues – the very first question on the seven or eight question script is, “If this year is wildly successful for you and your team, what happens? What does it look like a year from now if you and your team have really just knocked it out of the park?” And you just listen to their answers and say, “So what difference would all that make if you did that?” And you talk about that. Great. “What’s your assessment of my team in terms of how we’re either helping you or hindering you on that quest? Give me some feedback on what I might keep doing, start doing, stop doing kind of behaviors, for my team,” and it kind of leads to “What can I or my team do to support you on your agenda?” And ideally, that goes so well that the other person says, “Hey, let me ask you the same questions.” And go back in the other direction. Invariably, what happens, one, you create a lot of good will, because most people aren’t usually on the receiving end of those kinds of questions. The conversations that executives typically have with their colleagues are a lot more transactional. They’re a lot more short-term focused, let’s solve this particular thing that’s right in front of us right now because that’s all we have time for, but to create a little bit of space for that. It’s more of a transformational conversation. It’s kind of in the suite spot between transactional and transformational. You’re creating some space with the open-ended questions. You’re creating some space with the questions to even have the conversation, to just learn more about them with the intent of, “I want to help them,” and by helping them, maybe we create some stuff together that’s a one-plus-one-equals-three scenario. I’ve seen that play out a ton over the years. Rebecca was a most recent example, just in terms of initiatives that her organization needed to pursue that nobody really was pursuing. Because they weren’t having the conversations. By taking the initiative to have the conversations, then they were able to identify where the opportunities were. Halelly: So that’s good for her. Good for the relationship with her colleagues. It’s good for the organization. It’s good for her team. It’s good for everyone. By the way, listeners, whether you are at that level or not, I think that’s a really good strategy to pursue. Scott: I completely agree with your point on that. That’s just good, no matter where you are in the organization. Halelly: Lots of people get very bogged down in their own silo and don’t think about that, picking their head up and looking around and actually even talking to other people in that kind of a way, a non-transactional kind of way. Scott, that was good. I am so glad we got some specifics there and I can’t believe we’re running out of time. So, to wrap up, I know that you have one specific action you’re going to share with our listeners, but before that, what’s new and exciting on your horizon these days? Scott: A couple of things. At a purely personal level, one of the things I’m most excited about is about a month and a half ago, I bought a beautiful, black Fender Stratocaster guitar. Fender, the company, the guitar company, they’ve got this amazing app called Fender Play, where in five minutes – you’ll love this, TalentGrow leader person – in five minute lessons they teach you how to play guitar and you can pick your genre. I picked rock because I’m like a frustrated rock star. You can pick country, alternative rock, I don’t know what else. There are like six or seven genres to pick from, and they teach you how to play guitar in that genre, starting with, “These are the strings on your guitar.” And so I’ve been doing it four or five weeks now and I know six or seven chords. I know how to transition between the chords pretty seamlessly. I’ve learned some riffs and simplified versions of some riffs in classic rock songs, and I’m super motivated to keep going. I just love that. That’s really cool. Halelly: That’s fun. And you’re laughing when you tell me about it, totally! It makes your brain hurt, right? You’re feeling those neuron connections being formed. Scott: Yeah, that is so true. Halelly: I’ve been learning accordion. Listeners don’t know this. Scott: Well, here it is – so why? That’s a fascinating thing. Why accordion? Scott: So this is your dad’s accordion that you’re learning on? Halelly: I have my dad’s accordion. Scott: That’s amazing. Wow. How do you learn accordion? Are you taking lessons from a teacher or what? Halelly: I’m taking lessons from a teacher and I drive to her house once a week and she gives me a lesson and then I have homework and practice. Scott: That is awesome. How is it going? Halelly: It’s going great. It’s very hard! Scott: I’ll bet. That’s like a pat your head, rub your stomach kind of endeavor I’d say. Halelly: Yes it is. A lot of moving things at once, and I feel like I’m holding my breath. I’m working so hard that I sometimes notice I’m holding my breath and concentrating. Anyway, I didn’t mean to hijack your story. Scott: No, no, one more question. Have you learned a song yet? Halelly: Oh yeah, multiple songs. Scott: Cool. What’s your favorite? Halelly: They’re short and ridiculously simple. Scott: That’s okay. What’s your favorite accordion song you’ve learned? Halelly: I don’t know. None of them, they’re all just sort of little songs. Scott: I think someday you need to open your show with you playing the accordion as your theme music. Halelly: Okay, maybe one day. Halelly: All right, you said two things. We got one. Good job on the guitar playing, that’s awesome. I want to hear you play one day! What’s the other? Scott: The other thing, this is on my to-do list and you’re my role model on this. I really have been working on this for two years and I cannot get past my idiosyncrasies on this. The podcasting thing. I really want to start a podcast and then host it and so I admire the fact that you were in episode 110. During the entire time that you’ve been recording 110 episodes, I’ve been thinking about doing a podcast and trying to get it started. That’s got to be the next thing. Halelly: What’s the biggest holdup? Scott: You know, being a perfectionist I think. I don’t want to release something that I’m not 100 percent happy with from a quality and sound standpoint and all that. And yours is amazing. I don’t know. I’ve got stories I need to get over, and I need some help. That's the other thing, I need some help. Halelly: Offline, I’m happy to help you however you want. I also have a great editor, his name is Tom and he does an amazing job. And you should work with him, because that’ll take the sound part off of your hand. Scott: Okay, hi Tom. Thank you. Halelly: That’s exciting. We’ve got to get some movement. We’re going to talk. Halelly: Next time you hear from Scott, it’ll be his podcast. Halelly: Scott, what’s one specific action that our listeners can take today, tomorrow, this week, to upgrade their own leadership skills? Scott: This might be a little scary for people, but it’s actually easier than you’d think. Identify, let’s say, three colleagues that you trust. Five is better than three, but if five sounds too scary, stick with three. Ask them to tell you one thing that they really appreciate about you as a leader, that they would encourage you to totally double down on, and one adjustment that you could make that would make you even more effective. If you can talk to five people about that, you’re going to see a little more pattern recognition, and if you want to take it to step two, that’s like the week one activity. Week two activity is consider the feedback and pick one thing that you want to work on and then go back to those same five people and ask them, “Give me your one best piece of advice for anybody who is working on being better at – “ fill in the blank. Listening without interrupting, or delegating to their team more or whatever it is. Pick one of those things and start working on that. Put it to work and ask them, it’s kind of like the example I mentioned earlier in the conversation. Give them permission to tell you when they see you doing that and permission to tell you when they don’t see you doing that. That colleague engagement is a huge element of how I work with people, because your colleagues see you way more than anybody else ever sees you. Way more than your coach is ever going to see you or probably even your spouse or partner. You work with people more probably than you see the people that you live with. So get them engage in helping you be better. One thing they want you to keep doing for sure and one thing that you could adjust and then their best idea for a simple to-do, likely to make a difference action stuff that could help you get better at that thing you need to adjust. Halelly: Like peer coaching or peer accountability buddies? Scott: Yeah, totally. Exactly that. Thank you for putting a name to it. Halelly: Sure, I love it. Thank you for sharing that Scott, and thank you for your time today. How can people stay in touch, learn more from you and about to you? We’ll link to the book in the show notes and to your website. Anything else? Scott: Sure. We have two websites for you to look at. One specifically on the book called TheNextLevel.info, and then if you want to learn more about the Eblin Group and what we do at the Eblin Group in general, it’s EblinGroup.com. Halelly: And on social media, should they follow you anywhere? Scott: Yes, thank you for asking. Twitter, LinkedIn and I’m kind of trying to be more and more active and do interesting things on Instagram, so if you’re an Instagram person follow me there. Halelly: Awesome. Will do. Well, thank you again. Thanks for coming back. We appreciate your time and all of your wisdom and we look forward to hearing you play guitar and we look forward to listening to your podcast. Scott: We’ll do a duet with the accordion, okay? Halelly: Yes, that would be fun! Scott: Thank you so much Halelly. I’m really honored to be a two-time guest on your great show. Thank you. Halelly: A boomeranger, thank you. Thanks for tuning in to another episode of the TalentGrow Show and I hope that you enjoyed Scott’s boomerang appearance on the show, and it’s amazing to think that 110 episodes elapsed between the first one that I released with him and now. I’m so excited. It’s been a great journey. He and I chatted about his little podcast challenge, as you can imagine, after we recorded the show, and I’m going to push him. Because he’s got so much great, amazing things to share and so many great connections of people that can share some amazing content with the world. Why hold back on it just because of a little perfectionism? Perfectionism is not very helpful. It is a monster. I keep her under my bed and I slay her regularly and she still sometimes gets the best of me, but it is absolutely not a helpful thing. So, do not succumb to perfectionism to stop you from making great progress. And, I hope that you will take action to learn a little more about what are some of those strengths and areas for development for you, based on your colleagues’ feedback. That’s Scott’s suggestion that you need to take action on. And then report back to me – what was your biggest takeaway? What did you do? How did it work? I want to know guys. Let me know. Thank you. You are here in the back of the podcast club, as always, and I thank you for listening and hanging in there, and until the next time, make today great.